Ok I'm new to Visio and fairly intermediate on sharepoint. Currently using Visio 2016, Sharepoint Designer 2013, and my company's Sharepoint is 2010 I believe. I hope I am posting in the right place but I am running into issues when it comes to Workflows. It worked.....except it did both flows. I tried to rearrange it in Sharepoint designer with an Else-If statement on the Approval and Reject. There are 28 of them. All with different ID##. So I redesigned the workflow a couple of different times. Same result. Just a bunch of errors on publiish attempt. Now I have this. And I am wondering if it would be good. But I am just asking for help. I am using the Actions/Conditions/Terminators within Visio 2016 for Sharepoint 2010. I have tried googling and it is all over the map with information. Any help would be appreciated. At this point I would be willing to set up a TeamViewer meeting. HA! I am also having other issues with Sharepoint I have questions on. But that can be saved for later or at another forum. Person out in the field submits a record for suppression. (Remove from the system) Reason has to be a valid reason not just because. They fill out the form, Record #, Last Name, First Initial, and reason for suppression and they hit submit. I get an email with a task to Approve/Reject Record for suppression. 1. 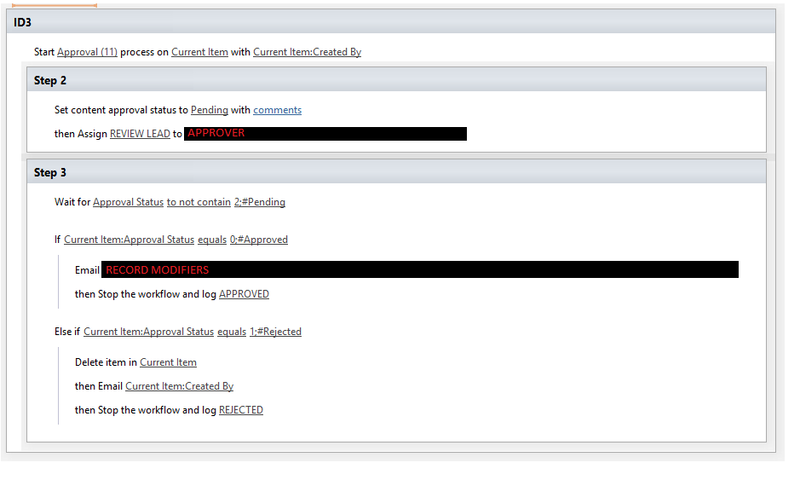 I hit approve, email gets sent to Personnel for suppression (cc creator of list item). Workflow Stops. Terminate. 2. I hit reject because their reason is stupid. They get an email saying it was rejected, item is automatically deleted from list, Workflow Stops. Terminate. What? Do I just put something and everyone will see it? Cool. You might be better off asking in a Sharepoint forum rather than here ... However, maybe if you post a bit more of the code around your if statements.